LSI’s competition entry - developed from an approach arising from an in-house brainstorming – presented a simple form on a cranked grid ‘laid’ over the landscape, allowing for future development. 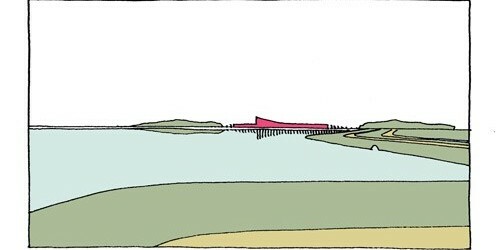 Two goals were set for the entry: a site layout strategy displaying a direct and evident link between the building and the vastness of the landscape and for a building which would sit well within the landscape, act as a ‘sign’ for the Centre, at the same time as being sophisticated in its understatement. We were delighted that the entry reached the final ten out of over 200 international entries.